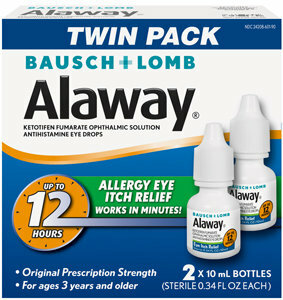 For the temporary relief of itchy eyes because of ragweed, pollen, grass, animal hair and dander. Keep out of reach of children. If swallowed, get medical help or contact a Poison Keep an eye on Center very quickly. For children 3 years and older: Put 1 drop in the affected eye(s) twice daily, each and every 8-12 hours, not more than twice per day. Store Alaway at 4°C-25°C (39°F-77°F). Benzalkonium chloride (0.01%), glycerin, sodium hydroxide and/or hydrochloric acid and water for injection.